Infirmary, National Leprosarium, Carville, Louisiana. The infirmary, built in 1933, had 68 beds in two open wards--men upstairs and women downstairs. Architects provided screened porches across the front of the building to allow patients fresh air. Notice the flat roof. Originally canopies had been installed to give patients a shady spot in the non-air-conditioned building and a place to catch a breeze. The infirmary was the first stop for each new patient. In the “Medical Records” room, one of the Sisters would begin a medical chart. “What would you like your new name to be?” was the first question asked a new admission. Before the discovery of the drug treatment for leprosy in the 1940s, most patients took a false name to protect their family from social stigma. Sanitary codes in effect across the U.S. governing the transport of deceased leprosy patients required a corpse to be thoroughly embalmed before transport. Some states required a metal coffin, soldered shut. Every state health department between Carville and the ultimate destination had to be notified in order to move a body home for burial. Given these many difficulties, many patients were buried here. Drive back down the avenue to the STOP sign. Turn right and continue to the second lamp post on the right, Stop 5. Infirmary under construction, 1933. Image Courtesy of the National Hansen's Disease Museum, Permanent Collection. Carville, LA. : In the earliest days of the Louisiana Leper Home (1894-1920), men and women had separate infirmaries on site. 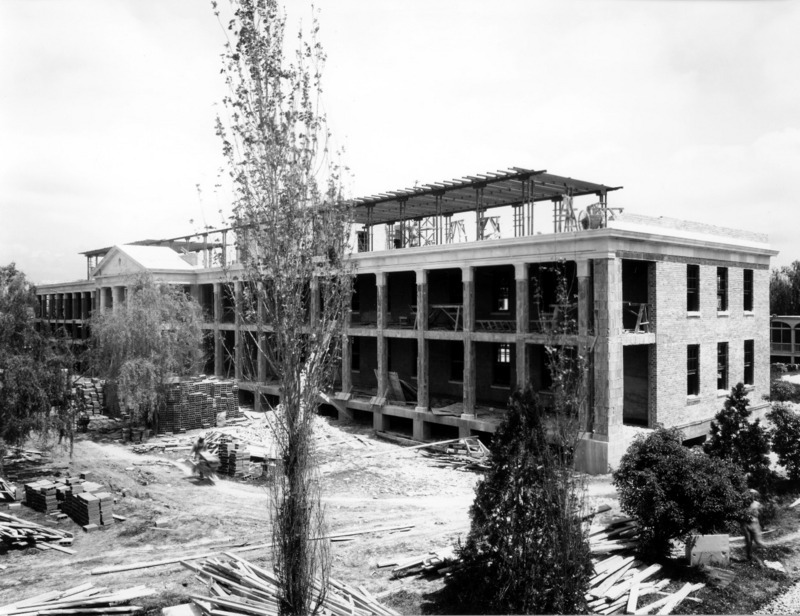 After the federal government took over administration of the hospital in the 1920s, U.S. veterans lobbied for a "modern and improved" infirmary to be built. Veterans were the first outside group to take an active interest in the welfare of leprosy patients at the hospital. Patient veterans formed an American Legion Post on site in the early 1930s. Infirmary completed in 1934. Image Courtesy of the National Hansen's Disease Museum, Permanent Collections, Carville, LA. : In 2005, the state of Louisiana renovated the old hospital infirmary into a conference center and hotel. Men's dressing clinic (left) and infirmary rooftop arbor (right). Image Courtesy of the National Hansen's Disease Museum, Permanent Collections, Carville, LA. : When patients were first admitted into the National Leprosarium, their condition was evaluated and treatment was administered. Because the building was completed decades before air conditioning, designers included a rooftop arbor where patients and staff could enjoy fresh air and a view of the Mississippi and nearby Lake Johansen. 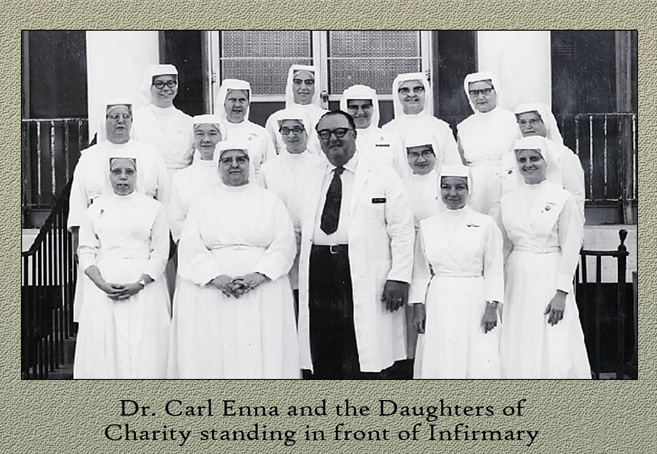 Dr. Carl Enna and Carville nursing staff in front of Infirmary, 1973. Image Courtesy of the National Hansen's Disease Museum, Permanent Collections. Carville, LA. : The Daughters of Charity served as on-site nurses from 1894 until 2005, when their "Carville Mission" was officially closed. Public Health nurses began duties here in the 1940's but the chief nurse was usually a Daughter of Charity. Promin Clinic, Infirmary, National Leprosarium. Reproduction of original oil painting from 1947 by Howard Baer. Image Courtesy of the National Hansen's Disease Museum, Permanent Collections, Carville, LA. : The Infirmary was the site of the first successful sulphone drug treatments for Hansen's disease. 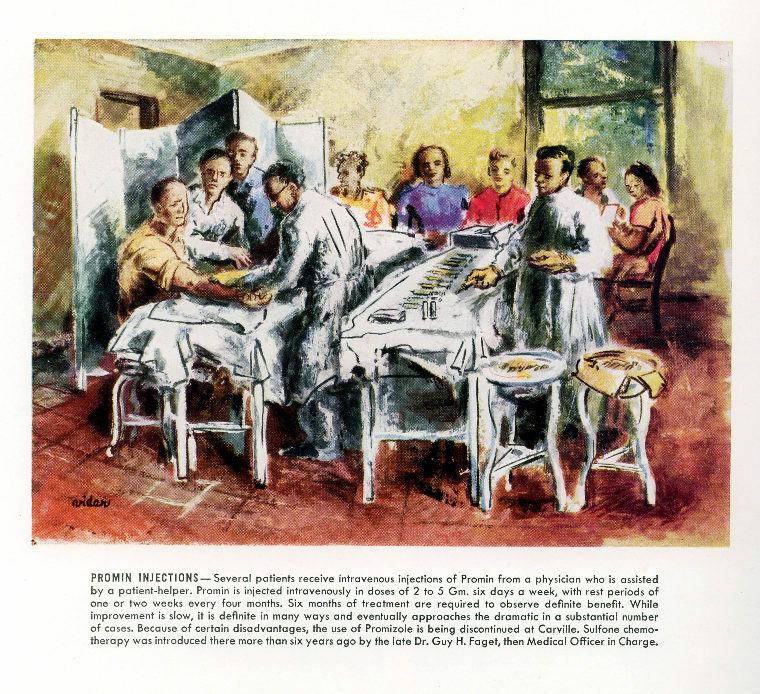 This painting was one of over 70 funded by Abbott Laboratory, the drug company who produced the oral form of the anti-leprosy drug in the late 1940's. Two of the original "Abbott Lab Paintings" hang in the museum. 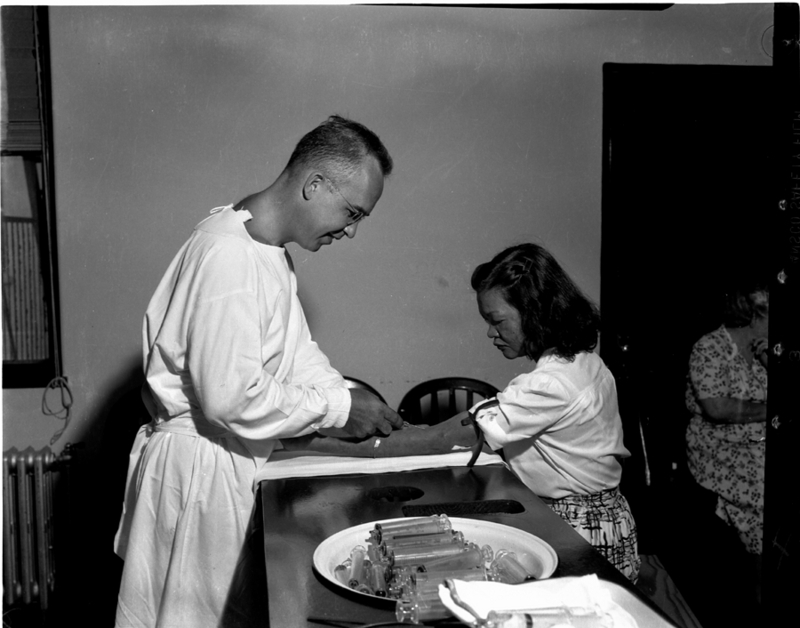 Doctor injecting leprosy patient, Joey G., with Promin. 1940s. Photograph Johnny H. Harmon. Image Courtesy of the National Hansen's Disease Museum, Permanent Collections, Carville, LA. : The first successful drug treatment for HD involved daily intravenous drug injections with a large gauge needle. Operating Room, Infirmary, National Leprosarium. 1940s. Image Courtesy of the National Hansen's Disease Museum, Permanent Collections, Carville, LA. : Carville doctors specialized in reconstructive surgeries of the hands and feet to correct damage done by Hansen's Disease. Dr. Paul Brand, Chief of Rehabilitation (1966-86) developed the groundbreaking "tendon transfer" surgical procedure, still used today, to correct disabilities caused by HD or other diseases. 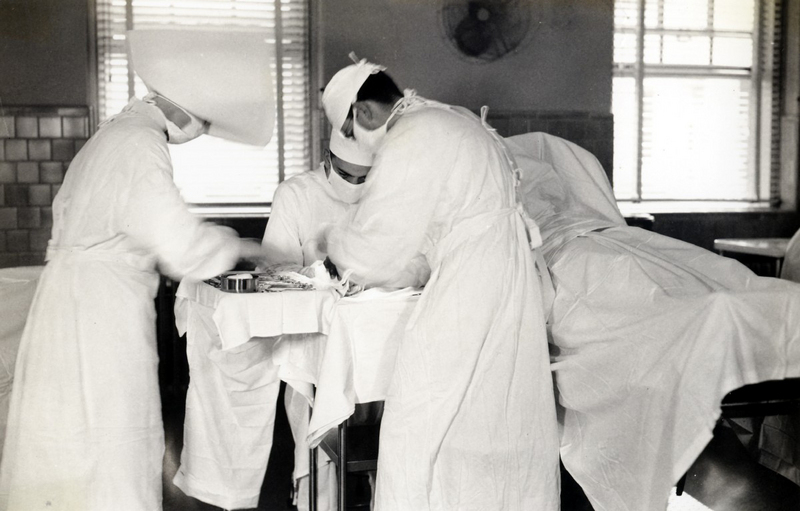 The Daughters of Charity wore full habits, even in the surgical suite, until the mid-1960s. Linen "nursing whites" were worn over the full blue woolen skirt and bodice of the orders' habit year round. 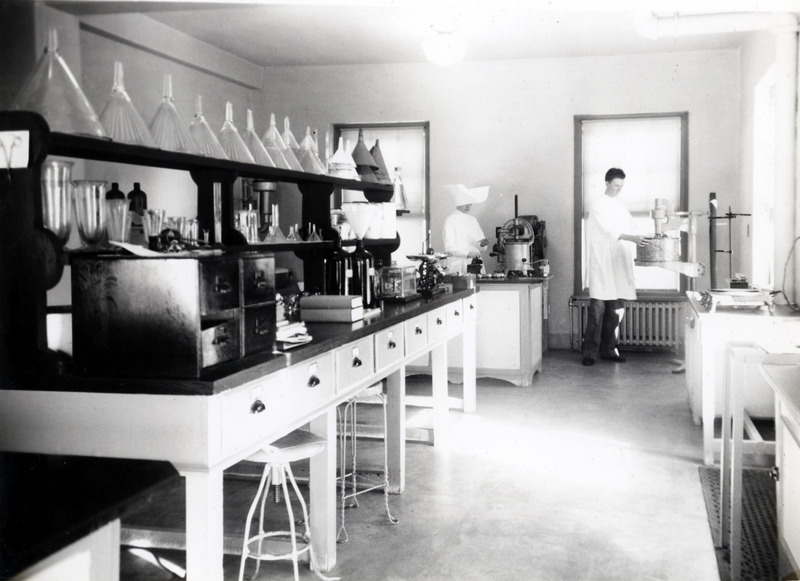 Sr. Hilary Ross in her laboratory, Infirmary, National Leprosarium, Carville. Image Courtesy of the National Hansen's Disease Museum, Permanent Collections, Carville, LA. : Sr. Hilary Ross, Daughter of Charity, Pharmacist, Biochemist. Carville, 1923-1960. 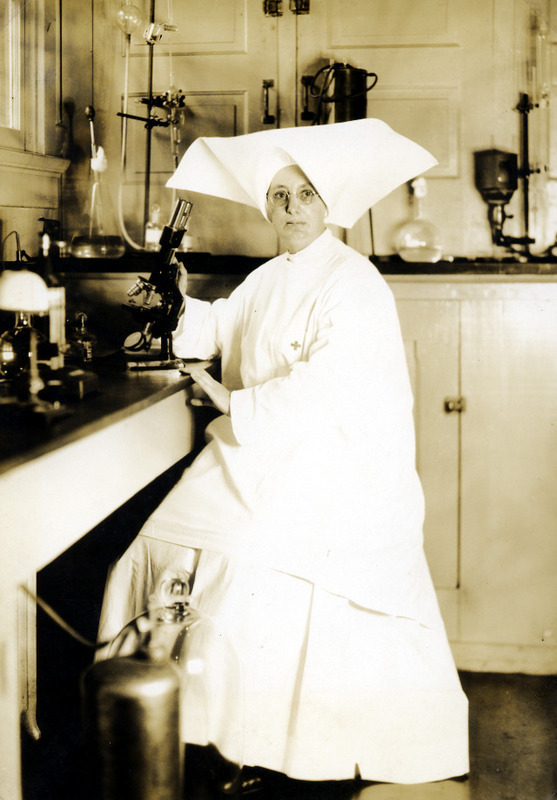 Sister Hilary Ross, Daughter of Charity, lived and worked at Carville Hospital from 1923 to 1960, where she helped to build a research laboratory for drug testing in partnership with Public Health Service Officer Dr. George Fite. Laboratory located in the Infirmary, National Leprosarium, Carville. Image Courtesy of the National Hansen's Disease Museum, Permanent Collections, Carville, LA. : When the U.S. Public Health Service took operational control of the hospital in 1921, laboratory research began in earnest on site. In the 1990s, laboratory research moved to the LSU campus in Baton Rouge, where it continues today. Christmas in the Infirmary, National Leprosarium, Carville, LA. 1930s. Image Courtesy of the National Hansen's Disease Museum, Permanent Collections, Carville, LA. 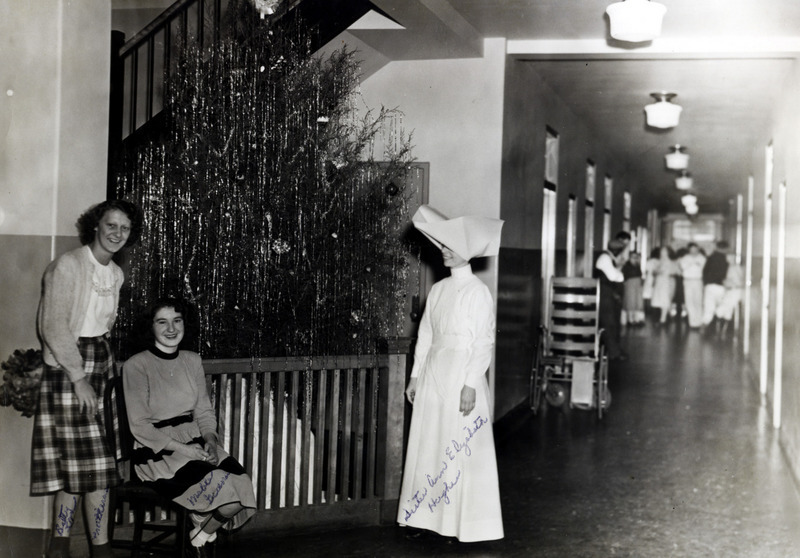 : Two young female patients and a Catholic sister belonging to the nursing order of the Daughters of Charity pose near a Christmas tree in the Carville Infirmary. 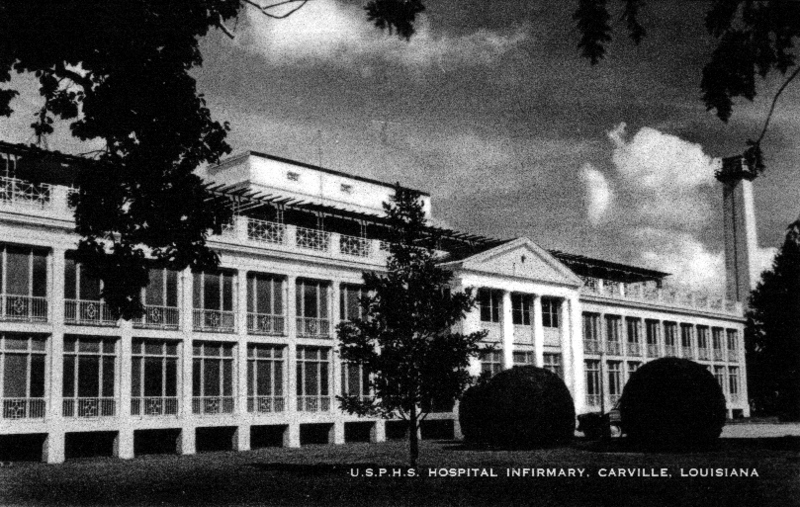 Audio narration of Stop #4, The Infirmary, on the Carville: The National Leprosarium tour. Elizabeth Schexnyder, Curator, National Hansen's Disease Museum, Carville, LA, “Infirmary, National Leprosarium, Carville, Louisiana.,” New Orleans Historical, accessed April 24, 2019, https://neworleanshistorical.org/items/show/770.